What Should Betsy DeVos Prioritize? Neag School alumna Dr. Laurie Henry has been appointed the next dean of Salisbury University’s Seidel School of Education. 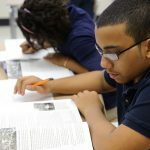 Joshua Hyman, a researcher at the University of Connecticut, studied the effects of mandatory ACT tests in Michigan’s public high schools and found that the policy led to many more low-income students not only taking the test, but performing well. The Maurice Sendak Collection will be an invaluable resource for UConn undergraduate students in English, Creative Writing, Art and Art History, the Neag School of Education, and Psychology, as well as our graduate students and visiting scholars. UConn’s baseball coach, Jim Penders, is the prime example of a coach who is very high on player development and the numbers don’t lie. Under his belt are numerous appearances in the NCAA tournament including a Super Regional appearance in 2011, three conference titles and a total of 43 players either drafted or signed by professional baseball clubs. According to Neag School psychology researchers James Kaufman and Ronald Beghetto, little-c creativity has been useful for addressing common misconceptions about creativity.